Door keys are used in conjunction with a Key Lock for locking a door. If the key is lost, the door is too, so don't forget to make extras! There used to be only 100 separate, randomly-chosen key variations that were possible, allowing raiders to 'lockpick' key locks by simply making ever single key and figuring out which ones worked through trial-and-error. 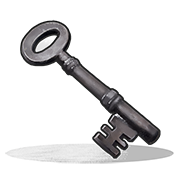 However, in Devblog 193, the amount of key variations was changed to 1,000,000, which makes this lockpicking strategy essentially unachievable (albeit still technically possible).